Architectural shingles vs synthetic slate roof – comparison chart. Available in wide range of colors from light grey to dark green. Perfectly match with any type of siding, brick or stone. Often imitation of natural slate tiles. Manufactured in many colors and shades. One of the most aesthetic and rich looking roofing materials. Can be installed on any sloped roof with 2:12 or higher pitch. Building codes might restrict installation of certain products. Some slate tiles should be installed on the roofs with minimum 3:12 pitch, other required minimum 6:12 pitch. Installation of slate roof should be performed according to local building codes. Depends on product, normally withstand 80 – 90 mph wind. Normally withstand 110 mph wind. Depends on product, but typically have a high resistance to open fire. Architectural shingles made from asphalt and laminate is a flexible, yet still durable material. Depends on quality, but normally slate is one of the most durable roofing options. It is hard enough to withstand the most severe weather conditions. Good ability to withstand feet impacts, but walking on a roof should be done with exceptional care and only in case of roof inspection, maintenance, or repair. Fair ability to withstand feet impacts. Fiberglass architectural shingles last about 30 years. Normally over 50 years, but lifespan depends not only on slate tiles quality, but proper installation as well. Using premium fasteners and stainless steel nail which basically insusceptible to rust in combination with adequate installation technique will ensure long lasting slate roof performance. Low maintenance roofing material, but cleaning required. Greatly vary, some manufactures offer limited lifetime warranty on certain products. Normally 50 years materials warranty. 2.1 – 2.3 lb/ ft2. Depend on thickness, vary from 3.8 to 6.5 lb/ft2. One of the most affordable roofing materials. Greatly vary, but significantly more expensive compare to architectural shingles. 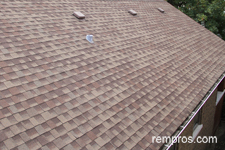 Architectural shingles is one of the cheapest roofing materials to install. From easy to moderate difficulty task. Installation of slate roof is not a do it yourself project. Installation of 35 squares of shingles on a medium slope roof is a one day project for a crew of 6. Replacement of the same size roof can be completed in couple days. Crew of 7 normally is able to install 40 squares of synthetic slate roof in 4 to 6 days. Replacement might take 7 to 8 days. Could be a hard task to repair a synthetic slate roof. A single layer of slate roof can be installed on adequately built roof structure. Nails failures, poor installed flashing. Synthetic slate normally last much longer and perform better compare to architectural shingles, but due to higher initial cost, it is still less popular roofing material. 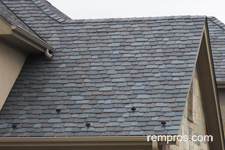 Slate is a premium roofing product and widely used while building expensive custom homes. Most mid-quality houses have shingles installed on the roof.